Visit Juneks CJDR – Your New and Used Car Dealership in Spearfish, SD! Welcome to Juneks CJDR in Spearfish, SD, and thank you for visiting our website! At Juneks CJDR, we stock a fantastic inventory of brand new vehicles with the latest models from some of the world’s most famous manufacturers. Whether you’re looking for a powerful new pickup truck for hauling heavy loads, or a compact car for fantastic mileage in the city and on the highway, Juneks CJDR will have an excellent option in store for you. We also stock a vast selection of high-quality pre-owned vehicles with dozens of available models ranging from newer cars with low miles to value vehicles under $10k. With excellent financing options available and a certified service center that will keep your car in great condition for years to come, we are your one-stop-shop for everything you need on the road. Visit our Spearfish, SD dealership today and let us find the perfect car for you. Juneks CJDR proudly serves all drivers from Spearfish, Rapid City, Sturgis, Deadwood and Lead, and the surrounding SD areas. As an authorized dealer of Chrysler, Dodge, Jeep, and RAM vehicles, our new car inventory has excellent options in place for every kind of driver. Motorists in the market for a great new pickup truck this year will be interested in the RAM 1500 and Ram 2500 with their impressive engine options and worksite-ready towing and hauling capabilities. Drivers who like to take their vehicles off-road will be thrilled with our massive inventory of new Jeep models for sale in the Spearfish region, including the exciting new Jeep Cherokee and Jeep Wrangler Unlimited with their rugged trail rated performance features and luxurious cabin options. Thrill seekers will want to make sure they check out the powerful Dodge Challenger, including the Hellcat model with up to 707 horsepower! Motorists from Spearfish, Rapid City, Sturgis, Deadwood, Lead and beyond have also been coming to Juneks for our fantastic new vehicle specials! These special offers on new cars are priced to sell quickly, so contact us or visit our Spearfish, SD dealership today for more information about pricing and availability. We can’t wait to meet you on our showroom floor. At Juneks CJDR, we stock a wide selection of high-quality pre-owned vehicles in all makes, models, sizes, colors, and styles to ensure that no matter what type of vehicle you have in mind, we have a great fit for you on our lot. With an excellent selection of vehicles under $10,000, an enticing list of featured used cars, and our special hometown pricing, drivers from Spearfish, Rapid City, Sturgis, Deadwood, Lead and beyond should make Juneks their first stop for fantastic pricing and some of the best deals in the area. All of the vehicles in our used car inventory are inspected and ensured to be in excellent running condition before being presented for sale, so you can drive home with peace of mind knowing that your new car will keep you taken care of on the road for years to come. For more information about our great selection of pre-owned vehicles, or with questions about any of the used cars you see on our site, contact us or visit Juneks CJDR today! We create fantastic car buying experiences at Juneks by providing an excellent selection of cars alongside terrific financing options so that you can drive home in the car you deserve without breaking the bank. Whether you have perfect credit, some rough spots, or are a first-time buyer, our extensive working relationships with all local lenders means we can get you behind the wheel of your next great car at an affordable monthly rate. With our Hometown Pricing program, you can buy assuredly knowing we price our cars competitively across all of the local dealerships! For the best customer service in our finance department, we encourage drivers to get pre-approved online! This will help streamline your buying process and get you on the road with your new car as soon as possible. 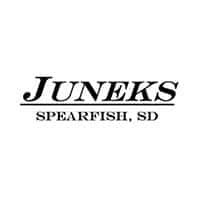 To speak with a team member in our finance department, or to find out what Juneks CJDR can do for you, contact us or visit our beautiful Spearfish, SD location today. After we help you find the car you’ve been looking for, we’ll continue working with you into the future with the highly trained staff in our service center! Every car requires maintenance, and whether you need major repair or simple scheduled service, no job is too complicated or too minor for the certified technicians in our shop. We strongly encourage all drivers to take advantage of our online service specials to make maintaining your vehicle more affordable than ever. Home mechanics and auto enthusiasts alike have also been coming to Juneks CJDR to buy genuine OEM parts in our parts department! We keep most commonly used parts and accessories on hand, and if we don’t have the particular part you’re looking for, we’ll order it for you. We also offer frequently updated parts specials, so make sure to check back often. For complete information about the menu of services in our parts and service departments, or to schedule service, contact us or visit our service center where we are open six days a week. With an excellent selection of new and used cars, an experienced finance department, and highly trained service technicians at your disposal, Juneks CJDR is your first location for everything automotive. Our zero pressure, zero hassle environment and high level of customer service have let us create fantastic car buying experiences for drivers like you in the Spearfish, Rapid City, Sturgis, Deadwood and Lead areas for years. We can’t wait to make you our next satisfied customer! Please contact us with questions about anything you see on our site, or visit our Spearfish, SD location today. We’re excited to find the perfect car for you.